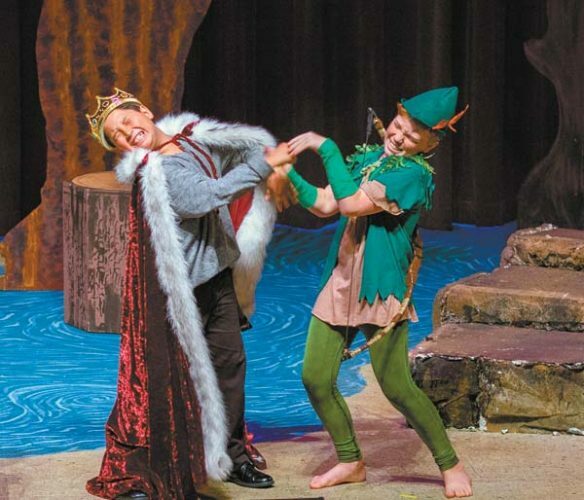 June has proven to be a cornucopia of the arts on Maui ranging from vanguard films, to Greek drama, Texas comedy, European cabaret and contemporary American dance. 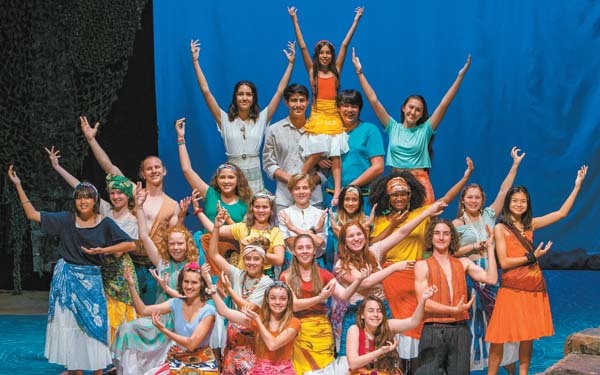 On Friday night I attended Adaptations Dance Theater’s “Bring It Home” at Seabury Hall’s exquisite ‘A’ali’ikuhonua Creative Arts Center in Makawao. This year’s company comprised of Angelynn Bair, Amelia Couture, Jen Cox, Nicole Humphrey, Hallie Hunt, Nathaniel Hunt, Ashley Krost, Ali McKeon, Emily McKeon and Nicole D. Yezzi presented ADT’s finest offering of its brief five-year existence. Arguably comparative to the works of a cosmopolitan dance company, ADT is, in my opinion, now primed to bring it away and showcase their outstanding creativity and skill on the mainland. The first piece of the concert, “In Between Infinite” was choreographed by guest artist Ali McKeon. All three movements of this world premiere work had a fragile and delicate quality, countered with laborious defined movement. Celestial and luxurious in nature, McKeon’s piece gleamed in its second movement, most notably in the featured performance by Yezzi. The fast-paced “patched” by Nathaniel Hunt, another world premiere, contrasted the majority of the program with its definitive masculinity and bustling East Coast energy. Pop-themed in style, “patched” was evocative of the big city, where one is surrounded by millions, yet alone at the same time and in constant survival mode as if they might be consumed. Of note was the superior solo work of Emily McKeon. 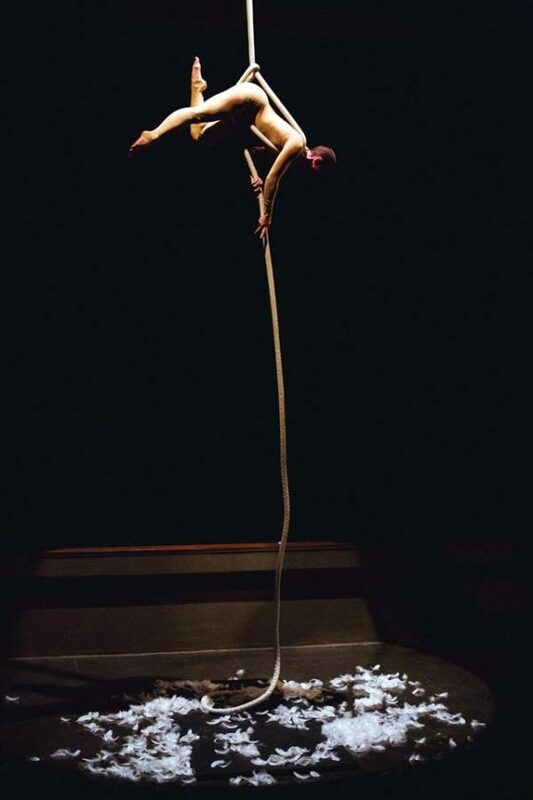 My favorite premiere of the night was “A Few Elements,” by Couture, Hallie Hunt and guest choreographer Heather Booth of Maui Aerial Arts. This affecting and resonant work evoked gothic and almost biblical imagery for me, particularly in its use of the music of George Frideric Handel and Arvo Part, edited and arranged by Toby Couture. The first movement, entitled “Apples,” found two dozen of the fruit rolling on stage, almost as obstacles, and being kicked by the dancers. The culmination was an entertaining and comical battle between Ashley Krost and Humphrey as both gripped the same apple in their teeth — Humphrey won taking a brutish bite while standing solo as the movement concluded. “Wet” was a dynamic dual showstopper featuring Nathaniel Hunt and Ali McKeon in a showcase of pure athleticism. Its imagery conveyed flight, marionette motion and crucifixion-like tableaus. The final, and most haunting movement “… a thing with feathers,” was absolutely (and at times literally) breathtaking. Soloist Amelia Couture worked aerially with a rope ascending, what appeared to be, 30 feet in the air at times. Climbing, hanging and falling, only to catch herself with her feet and legs, she left the audience gasping on several occasions. Couture’s close cropped hairdo combined with her single-handed struggle elicited, for me, a Joan of Arc simile. 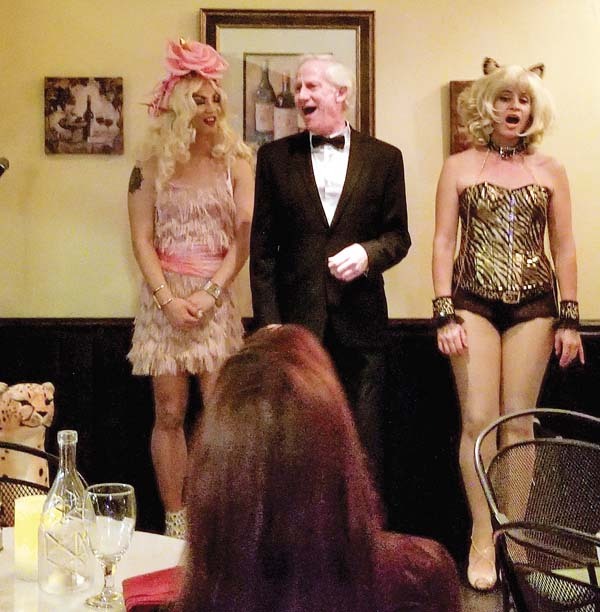 Every Monday in Maalaea RoseOx Productions (“The House of Yes”) presents “Cabaret del Vino.” Now in its second month of performances, co-producer Jennifer Rose explained how Maui’s latest ongoing show came about. Cafe del Vino owner, Guido Hauwaerts contacted Rose’s business partner Jim Oxborrow to produce a weekly Cabaret show. Dale Button was approached next to emcee the show. Rose and Button both hope that in time the cabaret will feature special guests each week with theme nights. On the Monday that I attended, the 60-minute set included performances by Button aka Dapper Dale, Diamond Di (Jayse Leong), Meow Meow L’Amour (Karen Stavish), castanetist Amee Adams and a stuffed cheetah. Leong also performs regularly with the Kihei-based drag troupe, The Misfits. I asked Leong if he had a signature song. “I love performing ‘Burlesque,’ the Cher song. I love pleasing the audience and it’s such a fun number that people enjoy,” he said. Kit Kat Club Cabaret and Cocktails & Cabaret regular, Stavish is no stranger to burlesque, comedy and cabaret. “There’s an upscale, wine bar feel here,” Stavish said of the intimate cafe. “It’s such a small space so burlesque numbers don’t fit, it’s more of a classic atmospheric show versus big, splashy showgirl stuff,” she said. Stavish also performs weekly with Free Range Comedy. “This was a way to get me singing again. When Jim asked me to join up I thought ‘wait, I have all these costumes hanging in my closet and I want to sing.’ It was the perfect storm,” she said. The equally busy Button just completed a role in “Medea,” is currently in rehearsals with “9 to 5 the Musical,” while also preparing to direct the upcoming Maui OnStage production of “Harvey.” I asked how he found time to organize and host a weekly cabaret. “I always have time for shows like this. Most of it runs around the costume changes, so I do two numbers to facilitate that. I tried costume changes too, but I gave that up right away. I decided to just go with the tux, which became Dapper Dale. My vision is to emcee the show and not be the show,” said Button. “I just want to see everybody (at the auditions) and not have any preconceived notions — tall, short, thin, fat, old, young — everybody,” he said. The numbers Button performed last Monday were selected from the musicals “Cabaret,” “Beaches,” and “Victor/Victoria.” Particularly delightful was the closing number, “You and Me” by Henry Mancini, in which Leong and Stavish accompanied him with strong harmonies. Stavish presented “Whatever Lola Wants” from “Damn Yankees” and Cole Porter’s “My Heart Belongs To Daddy,” and Leong added the Nancy Sinatra pop anthem “Bang Bang (My Baby Shot Me Down).” The artists will continue to present different songs, costumes, props and comedy every week, but it was heavily spiced with Bob Fosse-motifs last Monday. “It’s playful, old-fashioned and vintage Broadway-flavored cabaret,” said Stavish. * Cabaret del Vino is presented every Monday night. Dinner seatings begin at 5:30 p.m. with a 7 p.m. performance at Cafe del Vino in Maalaea. Dinner with the show is $70. For reservations or more information, call 868-0732. 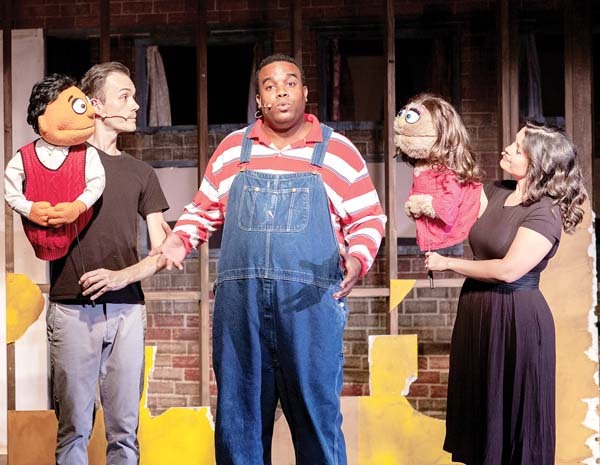 “Red, White and Tuna” by Ed Howard, Joe Sears and Jaston Williams, directed by Victoria McGee, concludes this weekend at the ProArts Playhouse. William Hubbard and John Williams play the entire population of Tuna, the third smallest town in Texas, in the sequel to “Greater Tuna,” where the Lions Club is too liberal and Patsy Cline never dies. 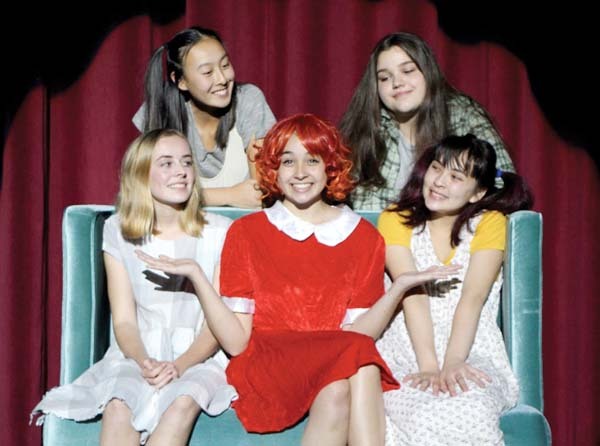 * Performances are at 7:30 p.m. Thursday through Saturday and 3 p.m. Sunday at the ProArts Playhouse in Kihei. To purchase tickets, call 463-6550 or visit www.proartsmaui.com. ProArts Playhouse will be holding auditions for “The Elephant Man,” by Bernard Pomerance from 6:30 to 9:30 p.m. on July 6 and 10 a.m. to 2 p.m. on July 8 at the ProArts Playhouse. John Merrick is a man living with horrifying, rare skin and bone diseases. Seen as a freak by society, Merrick’s life changes when Dr. Frederick Treves begins to care for him. Roles are available for five men and one woman to play multiple parts. Actors should be prepared to cold-read from the script. Performances of “The Elephant Man,” directed by Sally Sefton-Johnston, will run weekends Sept. 22 through Oct. 8. To schedule an appointment call 463-0550 or for more information, visit www.proartsmaui.com. 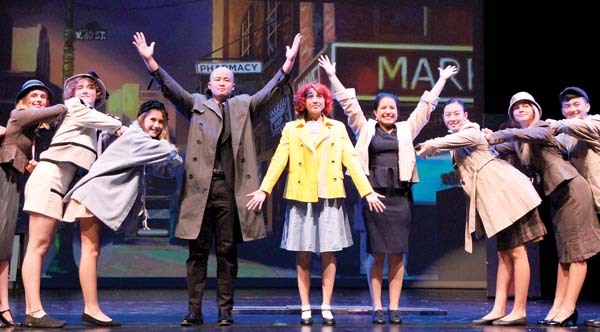 Maui OnStage will be holding auditions for “Harvey,” by Mary Chase from 6 to 9 p.m. on July 25 with callbacks on July 26 at the Historic Iao Theater in Wailuku. Elwood P. Dowd insists on including his friend Harvey in all of his sister Veta’s social gatherings. The trouble is Harvey is an imaginary six-foot-tall rabbit. To avoid embarrassment, Veta decides to have Elwood committed to a sanitarium. Audition appointments, scheduled in ten-minute increments are required. Actors should bring a headshot, resume and prepare a short comedic monologue. 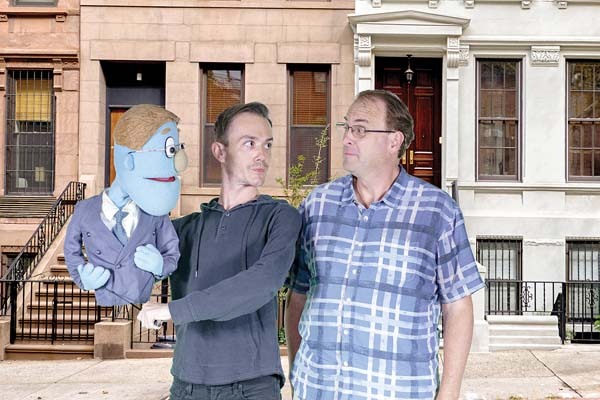 Performances of “Harvey,” directed by Dale Button, will run weekends Sept. 29 through Oct. 15. Character descriptions and more information are available at www.mauionstage.com. To schedule an appointment, call 244-8680 ext. 23.